Mahmoud Abbas, president of Palestine, is asking Britain for an apology for its having in 1917 issued the infamous “Balfour Declaration.” He won’t get one. The difference between the North Atlantic countries and the rest of the world is that the former are still committed to some key colonial arrangements made at the height of imperialism, which are perceived still to benefit the “West” in its grand strategy. Virtually no one in the rest of the world actively supports (as do the US and the UK) the continued expropriation of the Palestinians except the North Atlantic crowd, who perceive Israel as their human air craft carrier menacing the Middle East. (I know that the US and the UK occasionally make tut tut noises about Israeli squatter settlements on Palestinian land; these noises cannot be taken seriously given the billions in aid and other backing they proffer Tel Aviv). ” . . . I [had] mirrored a map of modern Palestinian history that has the virtue of showing graphically what has happened to the Palestinians politically and territorially in the past century. The map is useful and accurate. It begins by showing the British Mandate of Palestine as of the mid-1920s. The British conquered the Ottoman districts that came to be the Mandate during World War I (the Ottoman sultan threw in with Austria and Germany against Britain, France and Russia, mainly out of fear of Russia). But because of the rise of the League of Nations and the influence of President Woodrow Wilson’s ideas about self-determination, Britain and France could not decently simply make their new, previously Ottoman territories into mere colonies. The League of Nations awarded them “Mandates.” Britain got Palestine, France got Syria (which it made into Syria and Lebanon), Britain got Iraq. The first map thus shows what the League of Nations imagined would become the state of Palestine. The economist published an odd assertion that the Negev Desert was ’empty’ and should not have been shown in the first map. But it wasn’t and isn’t empty; Palestinian Bedouin live there, and they and the desert were recognized by the League of Nations as belonging to the Mandate of Palestine, a state-in-training. The Mandate of Palestine also had a charge to allow for the establishment of a ‘homeland’ in Palestine for Jews (because of the 1917 Balfour Declaration), but nobody among League of Nations officialdom at that time imagined it would be a whole and competing territorial state. There was no prospect of more than a few tens of thousands of Jews settling in Palestine, as of the mid-1920s. (They are shown in white on the first map, refuting those who mysteriously complained that the maps alternated between showing sovereignty and showing population). As late as the 1939 British White Paper, British officials imagined that the Mandate would emerge as an independent Palestinian state within 10 years. In 1851, there had been 327,000 Palestinians (yes, the word ‘Filistin’ was current then) and other non-Jews, and only 13,000 Jews. In 1925, after decades of determined Jewish immigration, there were a little over 100,000 Jews, and there were 765,000 mostly Palestinian non-Jews in the British Mandate of Palestine. For historical demography of this area, see Justin McCarthy’s painstaking calculations; it is not true, as sometimes is claimed, that we cannot know anything about population figures in this region. See also his journal article, reprinted at this site. The Palestinian population grew because of rapid population growth, not in-migration, which was minor. The common allegation that Jerusalem had a Jewish majority at some point in the 19th century is meaningless. Jerusalem was a small town in 1851, and many pious or indigent elderly Jews from Eastern Europe and elsewhere retired there because of charities that would support them. In 1851, Jews were only about 4% of the population of the territory that became the British Mandate of Palestine some 70 years later. And, there had been few adherents of Judaism, just a few thousand, from the time most Jews in Palestine adopted Christianity and Islam in the first millennium CE all the way until the 20th century. In the British Mandate of Palestine, the district of Jerusalem was largely Palestinian. The second map shows the United Nations partition plan of 1947, which awarded Jews (who only then owned about 6% of Palestinian land) a substantial state alongside a much reduced Palestine. Although apologists for the Zionist movement say that the Zionists accepted this partition plan and the Arabs rejected it, that is not entirely true. Zionist leader David Ben Gurion noted in his diary when Israel was established that when the US had been formed, no document set out its territorial extent, implying that the same was true of Israel. We know that Ben Gurion was an Israeli expansionist who fully intended to annex more land to Israel, and by 1956 he attempted to add the Sinai and would have liked southern Lebanon. So the Zionist “acceptance” of the UN partition plan did not mean very much beyond a happiness that their initial starting point was much better than their actual land ownership had given them any right to expect. There is nothing inaccurate about the maps at all, historically. Goldberg maintained that the Palestinians’ ‘original sin’ was rejecting the 1947 UN partition plan. 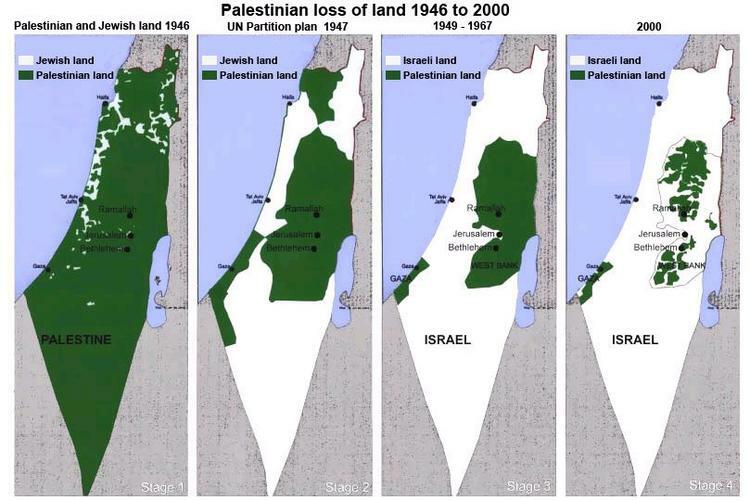 But since Ben Gurion and other expansionists went on to grab more territory later in history, it is not clear that the Palestinians could have avoided being occupied even if they had given away willingly so much of their country in 1947. The first original sin was the contradictory and feckless pledge by the British to sponsor Jewish immigration into their Mandate in Palestine, which they wickedly and fantastically promised would never inconvenience the Palestinians in any way. It was the same kind of original sin as the French policy of sponsoring a million colons in French Algeria, or the French attempt to create a Christian-dominated Lebanon where the Christians would be privileged by French policy. The second original sin was the refusal of the United States to allow Jews to immigrate in the 1930s and early 1940s, which forced them to go to Palestine to escape the monstrous, mass-murdering Nazis.